Posted February 26th, 2017 by Cecilia Wong & filed under Art, News. In the winter of 2002, I was crossing the English channel on the Eurostar to return to London. It was my favorite early evening train, where they served dinner at your seat. However, this turned out to be no ordinary journey. We did not get home until two the next morning—a five-hour delay. The train had been stopped at Calais on the French side, just before entering the tunnel. We were told that there were refugees clinging onto the underside of the cars. We had no idea there were already ‘Jungle Camps’ of refugees in Calais at the time. Before their removal in late 2016 by the French government, the Calais camps contained a passing collection of refugees from not just the initial Kurdish Iraqis but also many from the Horn of Africa and Sudan. They were trying to get to the United Kingdom to find work. 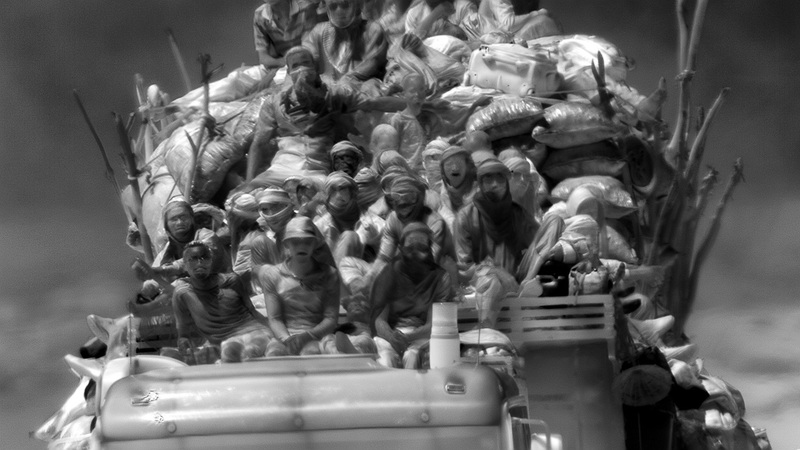 Nowadays, refugees are no longer seen as individuals clinging onto the bottom of trains. They are seen as masses of human bodies moving across lands and seas—measured by their body heat—heat on the brink of cold any moment. The lack of detail—the abstraction—only adds to the eeriness. All of us are on this Earthship together. Locking ourselves inside the first class cabin will not save us when the ship sinks—even if it takes fifty years, or one hundred.